Keepalived is a routing software, that provides a framework for load balancing and high availability. Keepalived provided high availability using the protocol VRRP to router failover and the load balancing is provided by LVS. 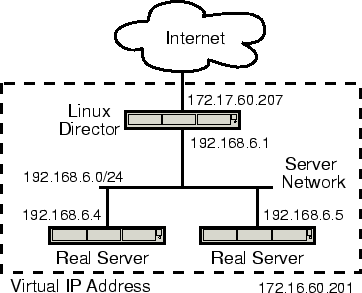 For this scenario I’ll use the NAT load balancing method, working with keepalived, and as health checker for the backend servers to check if one of the backends nodes fails keepalived reports to the kernel to remove the node of the LVS topology. – delay loop: specify in seconds the interval between checks. – persistence_timeout: timeout value for persistent connections. – real_server: specify a real server member. – weight: specify weight for load balanced decisions. – TCP_CHECK: check real servers with TCP connection. – HTTP_GET: checking real servers using HTTP_GET request. – connect_timeout: connect remote server using timeout. – nb_get_retry: maximum number of retries. – delay_before_retry: delay between two successive retries.